"This book moves like Air Force One. Big and fast. Clinton and Patterson are a dream combo." 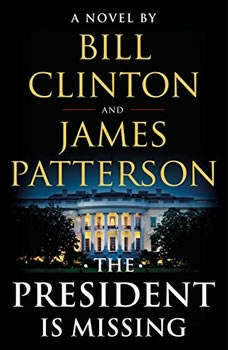 --Michael Connelly, author of the Ballard and Bosch seriesThe publishing event of 2018: Bill Clinton and James Patterson's The President Is Missing is a superlative thriller . . . one that can really happen, and one that must not be missed. The President Is Missing confronts a threat so huge that it jeopardizes not just Pennsylvania Avenue and Wall Street, but all of America. Uncertainty and fear grip the nation. There are whispers of cyberterror and espionage and a traitor in the Cabinet. Even the President himself becomes a suspect, and then he disappears from public view . . . Set over the course of three days, The President Is Missing sheds a stunning light upon the inner workings and vulnerabilities of our nation. Filled with information that only a former Commander-in-Chief could know, this is the most authentic, terrifying novel to come along in many years. And a timely, historic story that will be read--and talked about--for years to come.